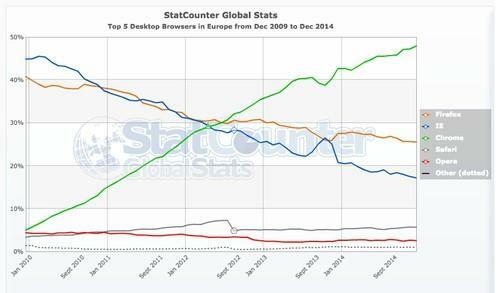 Top 5 desktop browsers in Europe between December 2009 and December 2014, according to StatCounter. For five years it showed the screen to new Windows users in a 2009 settlement of an antitrust case in which the European Commission found it had exploited its dominant position in the operating system market to push its own Internet Explorer browser. The choice screen -- at browserchoice.eu until Wednesday -- is now gone, and in its place is a message from Microsoft: "The obligations imposed by the decision have now expired and Microsoft will no longer maintain this website. Microsoft encourages customers who want more information about web browsers or want to download another browser to do so by visiting the websites of web browser vendors directly." The Commission's goal in imposing the remedy was to give other browsers developers a chance. The screen initially offered users a choice of Apple Safari, Google Chrome, Microsoft Internet Explorer, Mozilla Firefox and Opera, with seven other browsers revealed by moving a slider: AOL, Maxthon, K-Meleon, Flock, Avant Browser, Sleipnir and Slim Browser. The list was reviewed every six months and in the end showed Chrome, Internet Explorer, Firefox, Opera, Maxthon, SRWare Iron, Sleipnir, Lunascape, K-Meleon and Comodo's Dragon browser. The European browser landscape has certainly changed since 2009. Google's Chrome is by far the most used browser in Europe today, with a market share of nearly 48 percent this month, according to Web measurement company StatCounter. Internet Explorer usage has been steadily declining and Microsoft's browser now has a market share of about 17 percent, less even than Firefox's share, which has also been on the decline since the screen was introduced and now sits at around 25 percent. Opera Software, which filed the initial antitrust complaint against Internet Explorer's dominance, has seen its market share decline from about 4.5 percent in December 2009 to 2.6 percent this month, StatCounter figures showed. Opera did not immediately respond to a request for comment. Apple no longer develops the Windows version of its browser, having pulled out of the market as a result of poor uptake. The question remains though, how effective was the screen in serving its purpose? The Commission said that Microsoft's commitments contributed to restoring competitive conditions in the EU browser market. "The Microsoft commitments, in particular the browser choice screen, were a successful remedy," a Commission spokeswoman said, adding that the screen was viewed 795 million times and 165 million browsers were installed through it. It did not give more specific information about downloads though. A Microsoft spokesman said the company would not make any specific data available about the screen's usage. While the Commission counts the screen a success, it didn't always work as intended. Microsoft failed to include the screen in the Windows 7 SP 1 update, which led to a 63 percent decrease in Firefox downloads during the nearly 15 months that Microsoft failed to show the screen to SP1 users, costing the company about 9 million downloads. Microsoft was fined €561 million for failing to show the screen to Windows 7 SP1 users. Shortly after the screen's introduction, Microsoft was also criticized for not randomly scrambling the positions of the top five browsers, instead giving Chrome the best chance of landing in the preferred first spot.